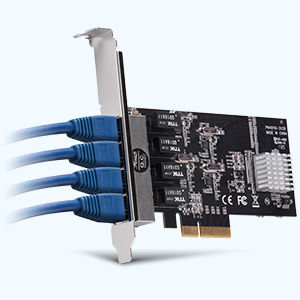 Rosewill RC-NIC413 allows you to add 4 Gigabit Ethernet ports to a client, server or workstation through a single PCI Express slot. It is fully compliant with Microsoft NDIS5, NDIS6 (IPv4, IPv6, TCP, UDP) Checksum and Segmentation Task-offload (Large-send and Giant -send) features. 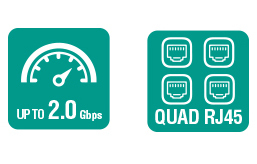 You’ll also get support for IEEE 802 Layer 2 priority encoding and IEEE 802.1Q Virtual bridged Local Area Network (VLAN) to lower CPU utilization, radically enhancing performance on your network server. With 10/100/1000 Mbps ports, the Rosewill RC-NIC413 greatly expands your network capacity, enabling instant, large file transfers. 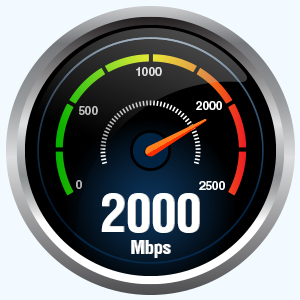 At home, the office, or on your business trip, you can work at Gigabit Ethernet speeds and instantly share your files online. Each port provides 10/100/1000 Mbps Ethernet and is fully compatible with IEEE 802.3/u/ab standards. 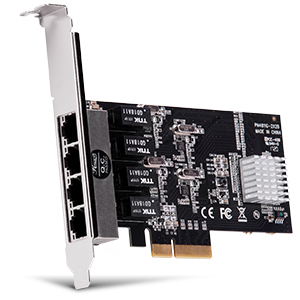 Suitable for any standard PCI Express-enabled system, the 2-port Ethernet card supports full-duplex flow control for maximum data transfer speeds of up to 2,000 Mbps.